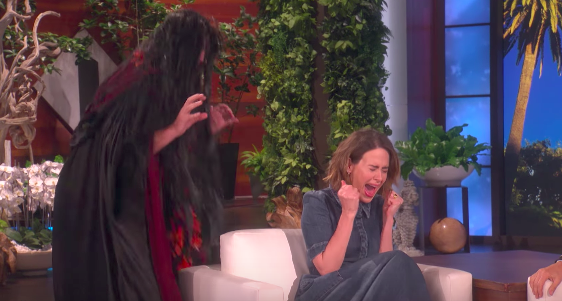 Ellen DeGeneres scared the bejeezus out of Sarah Paulson with clowns, and it's like IRL "American Horror Story"
Turns out, we’re not so different from our favorite celebs. Sarah Paulson is also a big baby in the face of her own American Horror Story. Since we’ve been watching AHS for years now and having the living daylights scared out of us on a weekly basis, this news gives us a strange sort of vindication. While appearing on Ellen Degeneres’s show, Sarah Paulson got some pretty typical Ellen treatment…three times over. First, Ellen popped out of the closet of her dressing room and scared her enough that it looks like she’s like…on the verge of tears!? Then she scared her again during the interview with some cape dude. And then to finish her off, Ellen inflicts on her what we’ve all had to suffer through since American Horror Story: Cult began. A CLOWN. 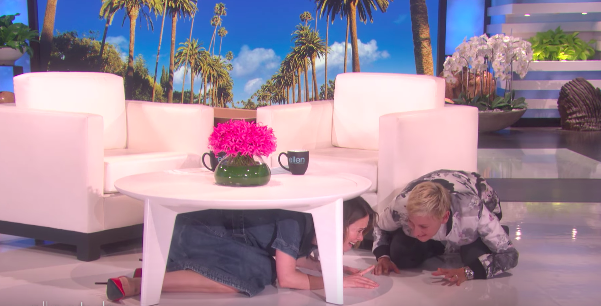 This was clearly poor Sarah Paulson’s breaking point, and she ended up cowering under the table in fear of Ellen’s next prank. We don’t envy Sarah Paulson this interview, like, at all, but we super admire her taking it so well. Because honestly, if we were chatting with Ellen Degeneres and a clown popped out of an end table, we’d pretty much be done with life. Forever. And ever. Etc. Check out the full sequence of scares below…definitely worth a watch and an LOL. Really, though, we FEEL for Sarah Paulson. Especially because she’s going to have to go back to work, and get paid to be scared by even more clowns. Life must be rough for this scream queen.